Consistently chosen by Hollywood as the setting for some of its most popular films and television series, Iceland's raw, elemental beauty beckons travelers to experience the visual delights of this northern island nation. In particular, Iceland's waterfalls are consistently sought as destinations for those who love photography and natural beauty. The island is ringed with dozens of breathtaking examples, meaning that visitors are never very far from at least one of these spectacular natural wonders. Iconic Mount Kirkjufell forms a brooding backdrop to the Kirkjufellsfoss waterfall, less dramatic of a water flow than some in Iceland but one that is ringed by a truly ethereal landscape. While summer is the perfect time to enjoy this waterfall, even the depths of winter can transform it into a lacy-edged spectacle of ice, making this a top destination for waterfall enthusiasts at any time of year. The Dettifoss waterfall forms a raging torrent of melting glacier water that is considered one of the largest in Europe. Visitors will appreciate the unfathomable power of nature while admiring the wide, roiling river that plunges over the rocky cliff, creating a haunting mist of spray and a thunderous roar. The waterfall is located in a national park that boasts its own unparalleled beauty. On Iceland's southeastern coast, avid fans of geology will enjoy a visit to Svartifoss, a waterfall set amidst fascinating geometric basalt pillar formations. The area is of particular interest to photographers due to the dark stone contrasting nicely with the white spray from the waterfall. 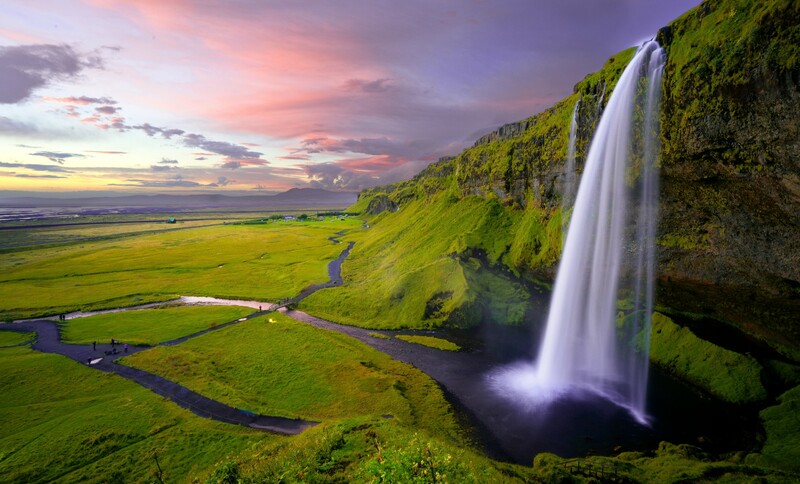 Also located on Iceland's southern end, the Seljalandsfoss waterfall is poised over an enormous half moon-shaped cavern that allows visitors the opportunity of walking behind it for a more dramatic angle. The water plunges over 200 feet to a shallow lake below before streaming across an expansive plain, offering amazing opportunities for photography enthusiasts. Located in an area of particular geothermic activity, the breathtaking Gullfoss waterfall plunges down into a crevasse set among steep-walled hills. As part of the Golden Circle, a famous trail drawing sightseers from around the island, this may be one of the most accessible of Iceland's waterfalls. The area is also home to a national park and the Geysir hot springs. No matter what season of the year you choose to visit this wonderful country, you'll find a wealth of natural beauty, cultural wonders and the cosmopolitan cityscape of Reyjavik to explore. If this amazing country and its incomparable waterfalls are on your short list of destinations to visit, you can always find out more here.